Upon first impression, Bazooka Rabbit seems like an entertaining little game with cool graphics and a fitting soundtrack. The question is whether this armed to the teeth rabbit is worth your precious time. Read on to find out how well this game performed in our exclusive AndroidPIT test! 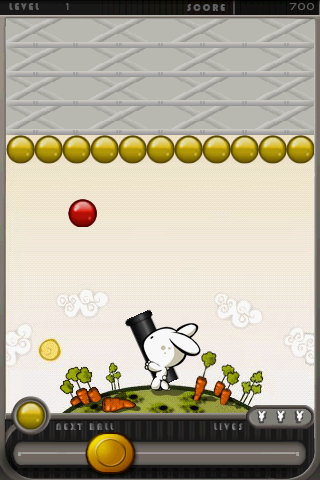 Bazooka Rabbit reminds me of games like Bubble Burst as far as the game concept is concerned. You've got to form a group of at least three balls of the same color to make them disappear. This is done with the help of Bazooka Rabbit (isn't that just about the greatest name ever?). 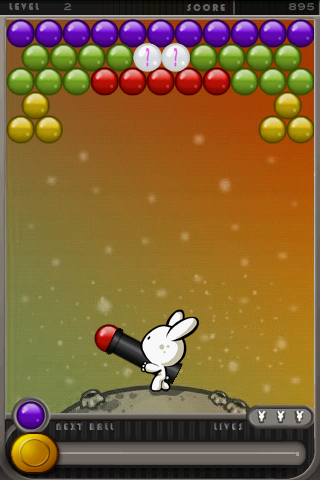 Bazooka Rabbit shoots balls into the air to clear groupings of colored balls. The balls keep on falling on you from above, threatening to squash your fearless rabbit. Each ball has a different color. There are also power ups in the shape of balls that either destroy everything in their row or balls that explode and temporarily halt the oncoming danger. Throughout the game you'll find different types of barriers, which can hinder or block the balls you shoot. Bazooka Rabbit may be just a fun little game to play when you're bored, but you have to admit that it's a heck of job in terms of graphics, sound and everything in between. That's the best thing about Bazooka Rabbit – it's an app that is clearly laid out and doesn't have any complicated menu options. 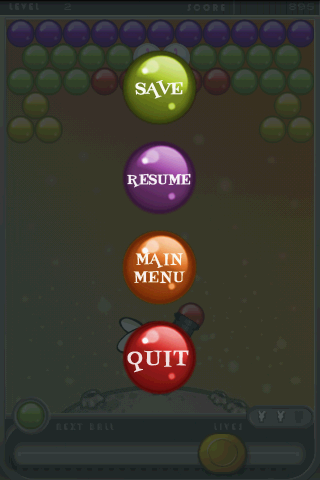 When selecting Play, you can choose between three different difficulty levels (easy, medium or hard). During the game you've got a kind of slidebar at the bottom with which you can adjust the bazooka's aim. The ball shoots out as soon as you let go. Controlling the ball with the trackball makes for more precise shooting, but slows you down a bit. Simply press down on the trackball to shoot the ball. The game is so self-explanatory that you could definitely figure this all out on your own in just a couple of minutes. You start the game off with three lives. During game play a small box let's you know how many lives (or rabbits) you still have available. At the bottom left you can see what colored ball or power-up is next in your shooting line-up. This helps you use tactical thinking when playing. When you don't manage to shoot down the balls in time, you literally get squashed by them. As mentioned before, the best thing about Bazooka Rabbit is the fact that the developers have managed to make the game's layout and controls as clear as possible for the user. Bazooka Rabbit is an all-around well-designed game. Everything is truly top-notch: the presentation, the controls as well as the game itself. You can test out the demo-version to get a little taste, but investing €1.45 for an entertaining little game is a pretty good bargain. Bazooka Rabbit's performance was absolutely satisfactory. It may take a bit of time to load, but the good graphics compensate for the short wait. The game never crashed and there were no complaints related to game speed. 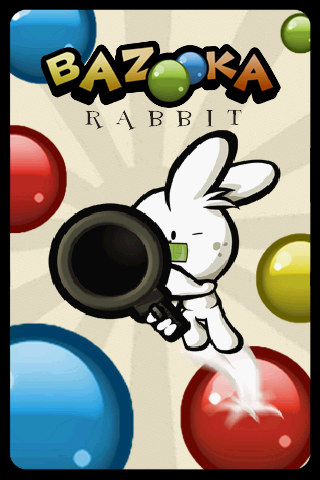 Bazooka Rabbit can downloaded for €1.45 from the Android Market. This one must have die a death.